Thelonious Monk could walk from his flat to New York's famous Philharmonic Hall on the corner of 64th Street and Broadway when he made his very first appearance there with his Big Band in December 1963. And the other musicians could get there on the underground: Phil Woods, Steve Lacy, Thad Jones - all of them were members of Monk's closest circle of collaborators. It is no wonder then that the well-known themes were highly agreeable and harmonious. 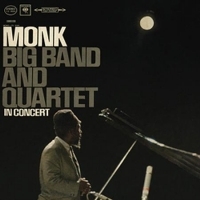 "I Mean You", "Four In One" and "Epistrophy" resounded through the auditorium, the audience was thrilled, Thelonious laughed and danced and a short while later fans could listen to parts of the concert on a recording released by Columbia Records. In a break for a smoke, Monk sat himself down at the piano and played "Darkness On The Delta" - nocturnal atmosphere pure. Does it bear the patina of times long past ? Absolutely not ! Thelonious Monk is as red-hot as he ever was. Recording : December 1963 at Lincoln Center, Philharmonic Hall, New York.